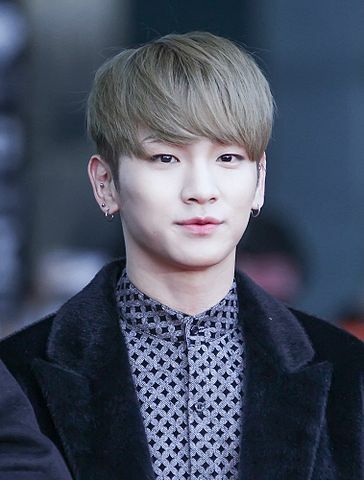 Kim Ki-bum (born September 23, 1991), better known by his stage name Key, is a South Korean singer, actor, fashion designer and television presenter. Born and raised in Daegu, South Korea, he later travelled to Seoul after a successful audition at the S.M. National Tour Audition Casting. In 2008, Key debuted as a member of South Korean boy group Shinee, who later went on to become one of the best-selling artists in Korea. Key is widely recognised as a singer, but he has also ventured into different careers, notably as an actor and fashion designer. As a singer, he has done many collaborations with various artists, and debuted in the sub-unit Toheart with Woo-hyun of Infinite. Key has also contributed in writing songs that have been released in Shinee’ and Toheart’s albums. As an actor, he was cast in multiple musicals, such as Bonnie & Clyde (2013), Zorro (2014), and Chess (2015). He has since widened his field as an actor by taking part in several television drama roles, like Drinking Solo (2016) and The Guardians (2017). In 2015, Key progressed to become a fashion designer and took part in numerous projects. For instance, collaborating with Bridge Shop House to design Shinee concert outfits, and worked with model Irene and the brand Charm's to design fashion apparels. Due to the successes of his works, Key was later appointed as fashion director of the group. In 2016, he became a model for the American fashion brand Jill Stuart. Characters Taemin, Kai, Jonghyun, Key, Minho, Suho, Chen, Onew, D.O. A collection of OnKey drabbles/short fics. I'm more on Taengsic, but for now i decided to pair taeny in this adoptation story of The Rich Man's Daughter. I decided to pair taeny because i am really guilty for making tiffany the bad in my story I'm the mistress, so here, let me feed you with taeny, this is going to be fun!!!! !